Hello and welcome to the 284th installment of the SWD. Three left over Islamic State’s improvised explosive devices killed four civilians in the city of Raqqa, as they were inspecting their homes. The incident occurred in Al-Zaydan alley, Masakin al-Taminat street, and in the city center. Hayat Tahrir al-Sham arrested a member of the media team that documented events in the rebel pocket of Madaya in Damascus governorate, as well as several other individuals. The individuals that were arrested are; Hassan Younis, a member of the media team, his brother Bakr Younis, member of the Syrian Civil Defense (The White Helmets), Amjad al-Maleh, a media activist, and Hussam Mahmoud, also a media activist. The individuals were arrested in Al-Qusur neighborhood of Idlib. Vehicle-borne Improvised Explosive device targeted Hayat Tahrir al-Sham’s court/headquarters in Al-Jalaa street of Idlib. The explosion wounded several civilians. Free Syrian Army’s Jaysh al-Nukhba (Elite Army) repelled Syrian Arab Army’s attack towards Tell Sakhr from Karnaz axis, in the northern Hama. Commander of the Jaysh al-Nukhba’s Liwa Thuwar al-Ghab, Ammar Hamidi said that two SAA‘s soldiers were killed and several wounded in the clashes. 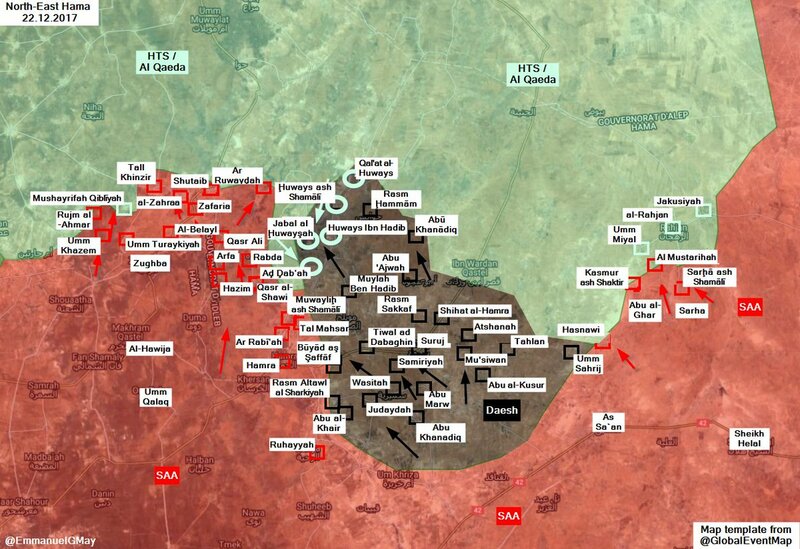 Hayat Tahrir al-Sham repelled Islamic State’s advance attempt on Tel al-Zaghbaq axis. Free Syrian Army’s Jaysh al-Izza released a statement calling on its fighters to stop targeting Syrian Arab Army’s positions in the northern Hama, in order to allow the Christian community to celebrate their holidays. Statement also says that the Syrian Arab Army supposedly established military headquarters and set up artillery positions in several predominately Christian villages. Islamic State claimed it assassinated a spy and a family working for the Syrian Democratic Forces in Gharibah area, northeastern Al-Suwar city. Syrian Arab Army and Ahrar al-Sham clashed in the ‘Army Armored Vehicle Base’ in Harasta, as the former tried to advance on the latter’s positions inside the base. Reports suggest that Ahrar al-Sham damaged one SAA‘s BMP during today’s clashes. Syrian Arab Army also tried to advance against the Faylaq al-Rahman in Jisreen. Syrian Arab Army’s artillery shelled Zamalka, Ain Terma, Hammouriyah, Al-Ashari, Harasta, Jisreen, Madyara and Kafr Batna in the East Ghouta. Rebels shelled Al-Wafideen crossing, reportedly wounding five civilians. Free Syrian Army’s Jaysh al-Ababil clashed with the Islamic State at the outskirts of Al-Tadamon neighborhood, south of Damascus. Jaysh al-Islam’s sniper reportedly killed a fighter of the Islamic State in Al-Basatin area, between Al-Hajar al-Aswad and Yalda. Islamic State’s Amaq Agency reported that Islamic State’s sniper killed an element of the Hayat Tahrir al-Sham in Yarmouk camp. Syrian Arab Army reportedly captured Khirbat Harqal from the rebel Jabal al-Sheikh operations room in Beit Jinn pocket. Rebel “Daraa Martyrs Documentation Office” reported death of a Free Syrian Army’s fighter, due to the clashes with the Syrian Arab Army at the outskirts of Umm Walad. Islamic State’s snipers killed five Iraqi Army’s soldiers near Al-Tarmiyah, according to the Amaq Agency. Iraqi Security Forces, backed by the Iraqi Army’s 6th Infantry Division conducted operations in Al-Fotouh area, south of Baghdad. The operations resulted in discovery of three left over Islamic State’s improvised explosive devices, which were safely detonated in a controlled explosion. Furthermore, several wanted individuals were arrested during the operations. Afghan National Security Forces conducted operations against the Islamic Emirate of Afghanistan (Taliban) in Shirin Tagab district, killing six fighters of the group. Afghan National Security Forces killed two and wounded four fighters of the Islamic Emirate of Afghanistan in Archi district. Afghan National Security Forces killed five fighters of the Islamic Emirate of Afghanistan in Nazyan and Ghani Kel districts. Among the killed IEA fighters are three Pakistani nationals. Islamic Emirate of Afghanistan’s improvised explosive device killed one and wounded another soldier of the Afghan National Army in Saydabad district. Islamic Emirate of Afghanistan raided Afghan National Army’s checkpoint in Mohammad Agha district. The raid resulted in killing of three and injury of two soldiers. Islamic Emirate of Afghanistan ambushed Afghan National Army’s infantry in Charkh district, killing three and wounding one soldier. Islamic Emirate of Afghanistan’s sniper killed an element of the Afghan National Police in Charkh district. Afghan National Security Forces conducted operations against the Islamic Emirate of Afghanistan in Andar district, killing three and wounding seven fighters of the group. Islamic Emirate of Afghanistan raided Afghan National Security Forces’ checkpoint in Shalgar directorate, killing and wounding several elements. Islamic Emirate of Afghanistan also engaged ANSF‘s reinforcements on their way to the attacked checkpoint, reportedly destroying a tank. Islamic Emirate of Afghanistan’s sniper wounded Afghan National Police’s element in Shalgar directorate. Afghan National Security Forces killed three fighters of the Islamic Emirate of Afghanistan in Gayan district. Security forces also destroyed two fighting positions of the Islamic Emirate of Afghanistan. Islamic Emirate of Afghanistan ambushed Afghan National Army’s convoy in Langar area of Pashtun Zarghun district. The ambush resulted in killing and injury of four soldiers, as well as in seizure of a motorcycle. Islamic Emirate of Afghanistan ambushed an element of the Afghan National Police in Bazar area of Pusht Rod district, killing him and seizing his assault rifle. Islamic Emirate of Afghanistan’s sniper killed Afghan National Police’s element in Ganj Abad area of Bala Buluk district. Afghan National Security Forces conducted operations against the Islamic Emirate of Afghanistan in the city of Tarinkot, capital of Urozgan Province. The operations resulted in killing of five and injury of three fighters of the Islamic Emirate of Afghanistan, as well as in discovery of a dozen improvised explosive devices. Afghan National Security Forces killed eight and wounded five fighters of the Islamic Emirate of Afghanistan in Maywand district. Islamic Emirate of Afghanistan ambushed Afghan National Army in Kondalan area of Shah Wali Kot district. The ambush resulted in killing of four soldiers and destruction of an armored vehicle with an RPG. In the same area, Islamic Emirate of Afghanistan’s improvised explosive device targeted Afghan National Army’s elements as they were securing a road, killing two soldiers. Islamic Emirate of Afghanistan’s improvised explosive device destroyed Afghan National Army’s vehicle in Boki area of Arghistan district, killing two and wounding two elements of the army. One of the two wounded elements is the commander of the army, Tor Jan.
Islamic State’s Amaq Agency reported killing of two and injury of two “Shiites” in the city of Quetta, provincial capital of Balochistan.